A few weeks back my friend Nicole had a lovely dinner gathering for a group of lady pals, including yours truly. 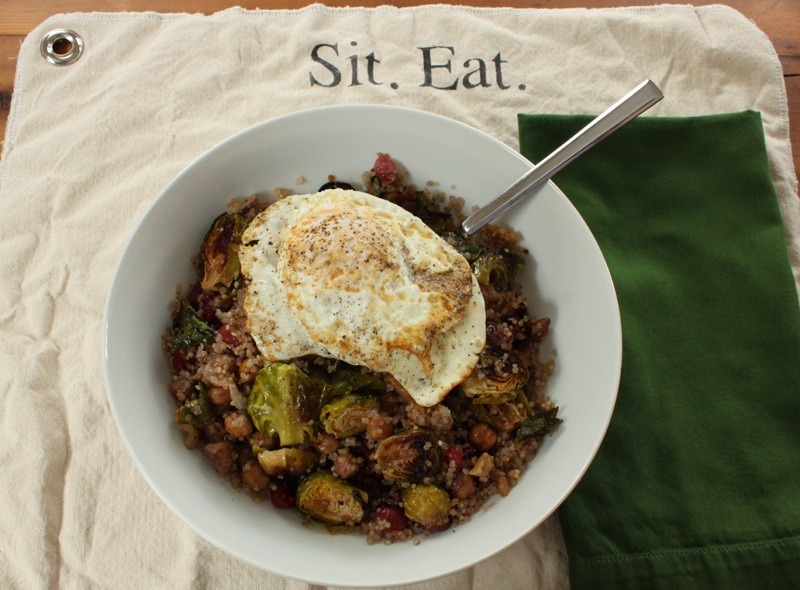 She made this divine brussel sprout and quinoa salad that I told her I needed to try at home. This is my take on it – I think the only difference is that I threw an egg on top and the proportions might be a bit different. Step 1 – Roast the brussel sprouts. Rinse and halve the sprouts. Spread out the sprout halves on a foil lined baking sheet and toss with EVOO, salt, and pepper. Roast on 450 degrees for 15 minutes until they are slightly brown. Step 2 – Cook up the quinoa. I like to use a 2:1 ratio of water to quinoa. So easy. 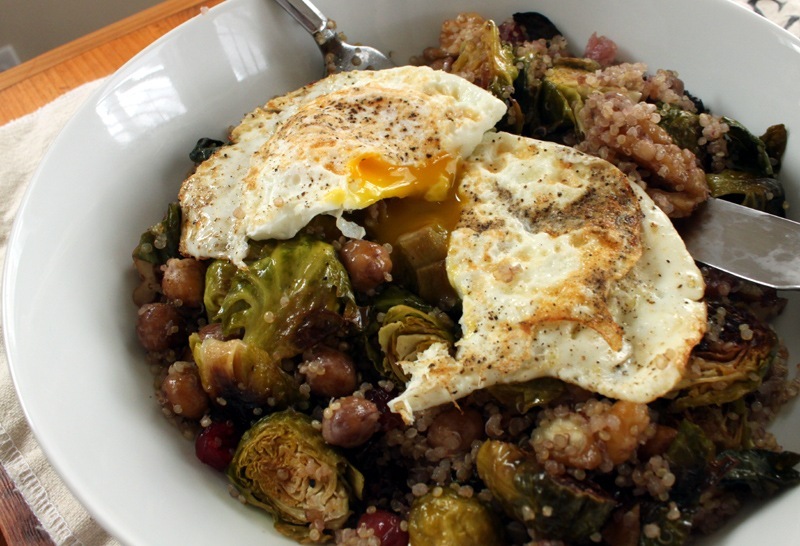 Step 3 – Put the warm quinoa and brussel sprouts into a big bowl. Top with the walnuts, cranberries, chick peas, and a little drizzle of EVOO and toss to combine. Set aside. Step 4 – Cook the egg over medium heat in a frying pan. Sprinkle on a little salt and pepper right when the egg hits the pan. I like a really runny yolk so I let it cook for 1-2 minutes on one side, flip, then another 1-2 minutes on the other side. Take the piping hot, over-easy egg and place on top of the salad in the bowl. Step 5 – Cut into the egg and let the yolk run through the salad. Enjoy! The flavors and textures going on in this salad are perfect. Sweet, savory, creamy, crunchy. Delicious!